The Dallas Police Department is seeking the public’s assistance in identifying two burglary suspects that were captured by the victim’s surveillance video. On July 13, 2018 at approximately 1:20 a.m., the suspects forced entry into an insurance company located in the 2500 block of S. Buckner Blvd. The suspects then used a sledge hammer to open the victim’s safe and took approximately $2000.00. It is believed the suspects are responsible for multiple burglaries of insurance companies in the Pleasant Grove area of southeast Dallas. This offense is documented on Dallas Police case number 152786-2018. On January 14, 2018 at approximately 5:00 a.m., the suspects forced entry into the Oportun Loans located at 2959 S. Buckner Blvd., and attempted to break into the safe. This offense is documented on Dallas Police case number 009900-2018. Approximately ten minutes later the same suspects broke into a second Oportun Loans located at 10325 Lake June Rd., and attempted a second safe burglary. This offense is documented on Dallas Police case number 009903-2018. The suspect vehicle used in these offenses is a white four door sedan, possibly a white Chrysler 300. The Dallas Police Department is seeking the public’s assistance in identifying the burglary suspects seen in this surveillance video. Anyone with information regarding the identity of the suspects is asked to call Detective T. French #9182 with the Dallas Police Southeast Investigative Unit at 214-671-0112. 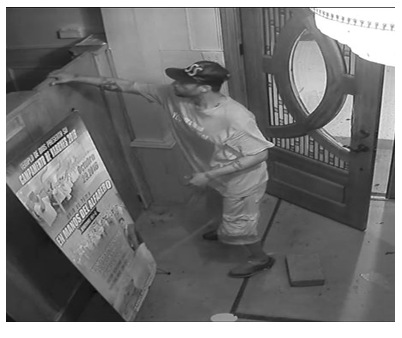 The Dallas Police Department is seeking the public’s assistance in identifying the burglary suspects seen in these images taken from surveillance video. 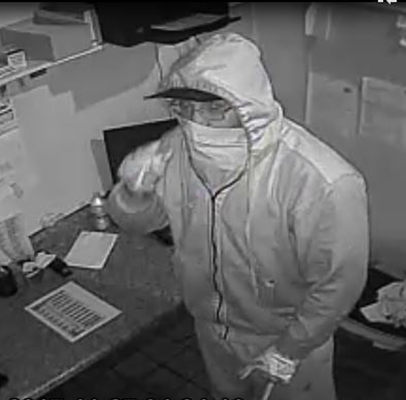 On November 27, 2017, at approximately 4:30 a.m., the suspects forced entry to Pollo Regio located at 6300 Samuell Boulevard. 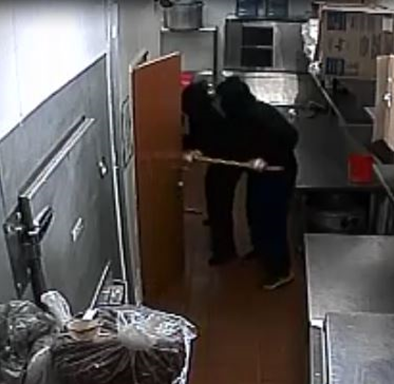 The suspects attempted to remove the business’ safe. This offense is documented on case number 269644-2017. Anyone with information regarding the identity of the suspects is asked to call Detective T. French #9182 with the Dallas Police Southeast Investigative Unit at 214-671-0112. 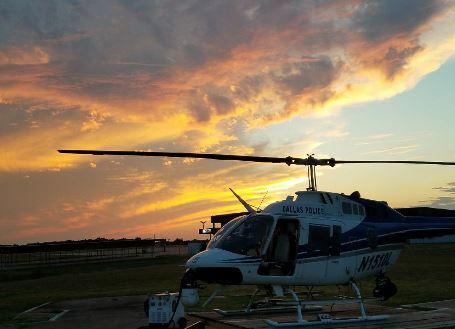 One can often find Dallas police helicopter Air One soaring above the city on any given day. Many people would be surprised to know that Air One also has the assignment of patrolling the city just like any officer in a squad car. They often recover stolen vehicles, look for missing persons, as well as assist officers on the ground. While on patrol this particular day, Air One discovered a marijuana grow operation within a remote area of southeast Dallas. On October 13, 2017, the Dallas Narcotics Division with the assistance of Air One, the Southeast Bike Unit and the Dallas Fire Department Swift Water Team, dismantled the grow operation and recovered over 179 lbs. of marijuana. Without our eye in the sky, this operation would not have been possible. At the time of the grow discovery, no suspects were located and the recovered marijuana is set for destruction. The Dallas Police Department is seeking the public’s assistance in identifying the burglary suspects seen in this surveillance video. On October 3, 2017, at approximately 11:30 p.m., the suspects forced entry to the Foot Locker located at 9310 E. R L Thornton Freeway. This offense is documented on case number 226580-2017. Anyone with information regarding the identity of these suspects is asked to call Detective T. French with the Dallas Police Southeast Investigative Unit at 214-671-0112. Update April 13, 2017, at 12:00 p.m. Homicide Detectives determined through DNA evidence that Michael Browning, a 19-year-old Black male was responsible for the death of Deangelo Jerod Golphin. Michael Browning is currently serving a 15 year sentence for Aggravated Robbery in a Texas Department of Corrections facility. Please see affidavit below. 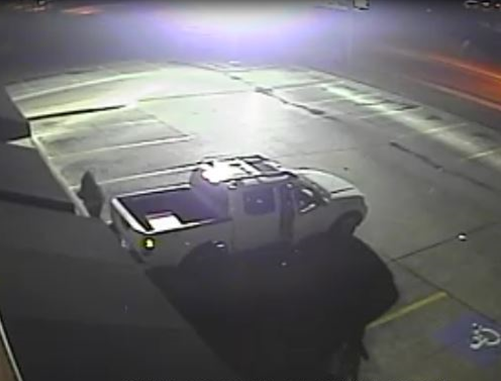 On Friday, February 12, 2016, at approximately 11:46 p.m. at 9230 Skillman Street, the suspect pictured in the video got into the car (parked at the gas pumps in the center of the frame) belonging to the victim, Mr. DeAngelo Golphin B/M 28. When Mr. Golphin got in the car, the suspect shot and killed him. The suspect can then be seen fleeing from Mr. Golphin’s car on foot. Dallas Police homicide detectives are releasing this surveillance video footage and requesting the public’s assistance in identifying the murder suspect shown in the video. The suspect is a black male, approximately 20-23 years old, 5’6” – 5’8” tall, with a curly afro that is shaved on the sides. The Dallas Police Department is asking that anyone with information about this murder contact Dallas Police Homicide Detective T. Stewart at 214-671-3635. If you wish to remain anonymous you may call Crime Stoppers at (214) 373–TIPS (8477). On Thursday, February 11, 2015, at approximately 8:17 p.m., Dallas Police Officers responded to a shooting call at the intersection of Ann Arbor Avenue and S. Marsalis Avenue. Upon Officers arrival, they observed the victim, Justin Manning Black Male 28, with multiple gunshot wounds. Mr. Manning was transported to Methodist Hospital, where he was pronounced deceased. On Friday, February 12, 2016, at approximately 11: 46 p.m., Dallas Police Officers responded to a shooting at 9230 Skillman Street. The victim, DeAngelo Golphin Black male 28, parked his vehicle at the gas pumps and entered the store. While Mr. Golphin was in the store, a Black Male suspect entered his vehicle. Mr. Golphin exited the store and returned to his vehicle. After Mr. Golphin got back inside his vehicle, the suspect shot him multiple times. The victim was transported to Presbyterian Hospital where he was pronounced deceased. The Dallas Police Department is asking that anyone with information about these murders contact the Dallas Police Homicide Unit at 214-671-3661. If you wish to remain anonymous you may call Crime Stoppers at (214) 373 – TIPS. 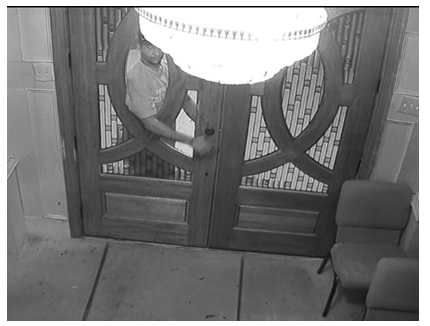 The Dallas Police Department is seeking the public’s assistance in identifying the burglary suspect seen in these images taken from surveillance video. On March 5, 2017, at approximately 11:49 p.m., the suspect forced entry to the Full Life Outreach Church located at 2923 N. Masters Drive and took several items. This offense is documented on Dallas Police case number 051868-2017. Anyone with information regarding the identity of the suspect is asked to call Detective French of the Dallas Police Department Southeast Investigative Unit at 214-671-0112. On October 8, and October 18, 2016 the Temple de Dios church was burglarized by the same suspect. 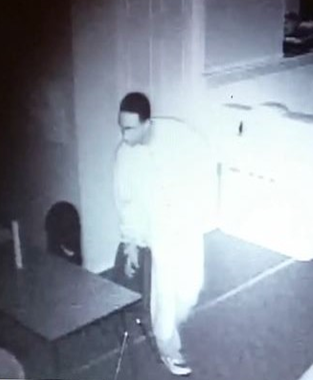 Surveillance video captured the suspect entering the church, as well as the suspect vehicle. 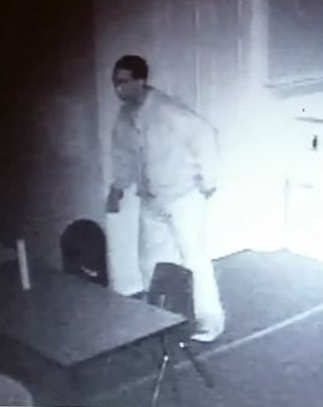 This surveillance footage was released to the media and as a direct result, an anonymous tip was called in which led to the identification of the suspect, Willie Derrick B/M 43. Dallas Police Detectives were able to locate and arrest Suspect Derrick on Friday, October 28, 2016 at a residence in the 3700 block of Carpenter Avenue. Suspect Derrick has been charged with both burglary offenses and was taken to the Dallas County Jail on a $15,000 bond. The Dallas Police Department extends its thanks to the media and to the community for working together to help us solve these crimes. The Dallas Police Department is seeking the public’s assistance in identifying the suspect pictured below. On Saturday, October 8, 2016 and Tuesday, October 18, 2016, the suspect forced entry to the Temple de Dios located in the 7800 block of Scyene Road. 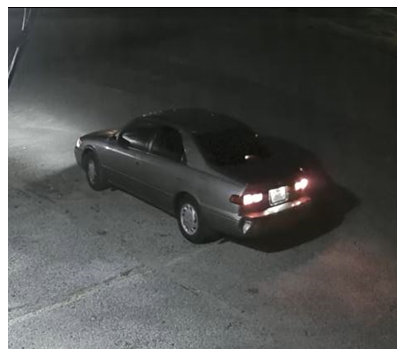 The vehicle pictured below was used by the suspect during the commission of both burglaries. Anyone with information regarding the identity of the suspect is asked to call Detective Travis French #9182 of the Dallas Police Department Southeast Investigative Unit at 214-671-0112. These offenses are documented on Dallas Police case numbers 242399-2016 and 250114-2016. On May 2, 2016, around 4:30 a.m. Ms. Antoinette Brown was attacked by a pack of dogs in the 3300 block of Rutledge. Ms. Brown died as a result of her injuries on May 9, 2016. Although no witnesses could say for certain which dogs were involved in the attack, residents pointed to a house on Spring Street where dogs have been known to escape their enclosure. Detectives responded to that location and spoke with the owner of the dogs. The owner surrendered the dogs to Dallas Animal Services where the dogs were held for a period of time and were processed for evidence. DNA Samples and evidence collected from the dogs were submitted to Southwest Institute of Forensics Science (SWIFS). Results from testing were negative for a match. The Dallas Police Department submitted the samples to the University of California at Davis for additional DNA processing to determine if a link could be made between the seized dogs and Ms. Brown. Dallas Police were notified by the University of California at Davis Veterinary Genetic Laboratories Forensics Unit that the samples submitted did not contain DNA evidence that would link the animals that were suspected of the attack to Ms. Brown. Based on the lack of evidence, detectives will be closing the case. The Dallas Police Department and Dallas Animal Services continue to work together to coordinate responses to animal disturbances and attacks to reduce injuries to citizens. On May 2, 2016, at 4:43 a.m., the Dallas Police Department received a call regarding a female in a vacant field calling for help at 3300 Rutledge Street. Police officers arrived at the scene at 4:50 a.m. Another call was received at 5:02 am from a different person that a female was being attacked by 4 to 5 dogs in a vacant field. Dallas Fire Rescue along with Dallas Police discovered Ms. Antoinette Brown in the vacant field and immediately transported her to Baylor Hospital. Detectives canvassed the area on the same day and interviewed both reporting persons at the location where the attack took place. Crime Scene processed the scene where the attack took place and went to the hospital to gather evidence from the victim. The reporting persons identified a nearby home where they believed the dogs may have come from. Detectives responded to the location and could not find anyone at the house and no dogs were located. Reporting persons were advised by detectives to call 311 if any dogs were spotted in the area. On May 5, 2016, Dallas Animal Services reviewed the address and found previous 311 calls regarding loose dogs complaints. Seven dogs were found living at the location and Dallas Animal Services was able to take 6 dogs into possession on May 6, 2016. The seventh dog was located on May 9, 2016 and quarantined. Between July 2013 and August 2014, records indicate residents made 10 calls regarding this location. In 2014, the owner surrendered ten dogs after repeated visits and violation notices from Dallas Animal Services. In September 2015, neighbors reported an attack in progress, resulting in five citations being issued and surrendering of three more dogs that were subsequently euthanized. Dallas Animal Services issued an additional 16 citations on May 6, 2016. The owners gave permission on May 6, 2016 for Dallas Animal Services to take custody of the animals. These dogs were processed for evidence to confirm whether they were involved in the attack on Ms. Brown. Dallas Police have submitted the evidence to Southwest Institute of Forensics Science and are awaiting the results of testing. The Dallas Police Department is investigating this incident as an Attack by Dog offense as defined in Section 822.005 of the Texas Health and Safety Code. (2) knows the dog is a dangerous dog by learning in a manner described by Section 822.042(g) that the person is the owner of a dangerous dog, and the dangerous dog makes an unprovoked attack on another person that occurs at a location other than a secure enclosure in which the dog is restrained in accordance with Subchapter D and that causes serious bodily injury, as defined by Section 822.001, or death to the other person. (b) An offense under this section is a felony of the third degree unless the attack causes death, in which event the offense is a felony of the second degree. (c) If a person is found guilty of an offense under this section, the court may order the dog destroyed by a person listed in Section 822.004. (d) A person who is subject to prosecution under this section and under any other law may be prosecuted under this section, the other law, or both. On May 9, 2016, at approximately 8:00 p.m., Ms. Brown passed away as a result of her injuries while at Baylor Hospital. This remains an ongoing investigation.